DreamWorks Animation returns to the island of Berk five years in the future to catch up with Hiccup (Jay Baruchel) and Toothless in “How To Train Your Dragon 2,” the sequel to it’s successful predecessor, which debuted in 2010. 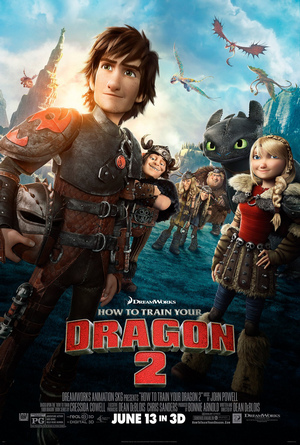 Visually stunning and full of heart, “How To Train Your Dragon 2” delivers incredibly well-done animation and character development that sets a new standard for animation in terms of sequels. The story is complex and keeps the audience on the edge of their seats from the start. Twenty-year-old Hiccup is still as sarcastic and rebellious as ever, but shows a new self-confidence that was absent from his character five years ago. Although Hiccup shows significant growth in terms of design (check out that stubble!) and personality, sadly the same can not be said for his pack of viking hooligans, who are rarely seen throughout the film other than to provide comedic relief. However, the relationship between Hiccup and now girlfriend of five years, Astrid (America Ferrera), shows more realistic development and communication skills than you might expect from a movie aimed at children. Without being too romantic or sensual, the two dragon riders are obviously positive forces in each others lives and are continuing to show genuine care for one another, which is exciting to see as a model for younger audiences. The film introduces three new characters, including the enemy-turned-ally Eret, Son of Eret (Kit Harington), who proves to be the fruit of Hiccup’s relentless push for peace. Although this character had much potential for more in-depth characterization, his story sets up a promising future for the next film in the series, set for a 2016 release. Also introduced is Drago Bludvist (Dijmon Hounsou), the film’s main antagonist. Not much light was shed on this character; he seemed to just be evil right down to the core, with no redeeming qualities. As an antagonist, he kind of fell flat, and really it was his giant Bewilderbeast dragon that was the driving force behind his fear-factor. Despite these characters which were arguably less than memorable, they were completely made up for with the introduction of Hiccup’s long-lost mother, Valka (Cate Blanchett). After spending most of her adult life living with dragons, she is expectedly a little awkward, but the flashbacks of her life on Berk add much needed background and depth to not only her character, but Hiccup as well. Valka acts as the final piece in the puzzle of Hiccup’s identity, after telling him he has, “the heart of a chief and the soul of a dragon”. DreamWorks takes a big risk after this point in the movie, moving towards incredibly dark events for a children’s film. Although there is no graphic violence or blood, the film showcases the casualties of war and the all-too-real consequences of death when Toothless is brainwashed into accidentally killing Stoic. This sequence of events is what is setting “How To Train Your Dragon 2” apart from other films of it’s kind, but also pushing the boundaries for what is acceptable in a PG film. However, this was a great move to keep driving the story in terms of plot, as it forced Hiccup to step up and accept his responsibility as Chief of Berk. It also sets in motion a series of events for Toothless, who takes over as Alpha Dragon after challenging the Bewilderbeast. “How To Train Your Dragon 2” finished off it’s opening weekend with $50M domestically, falling a bit short compared to the hype. However, it is easily one of the best animated sequels, if not the best, and a must see for all ages this summer.